Yes, I know, I have a bunch of Pumpkin Cocktails already but I didn't have one that included bubbly. Plus I have a couple of bottles of Homemade Pumpkin Liqueur to play with again this year so, fizzy pumpkin cocktails here I come. 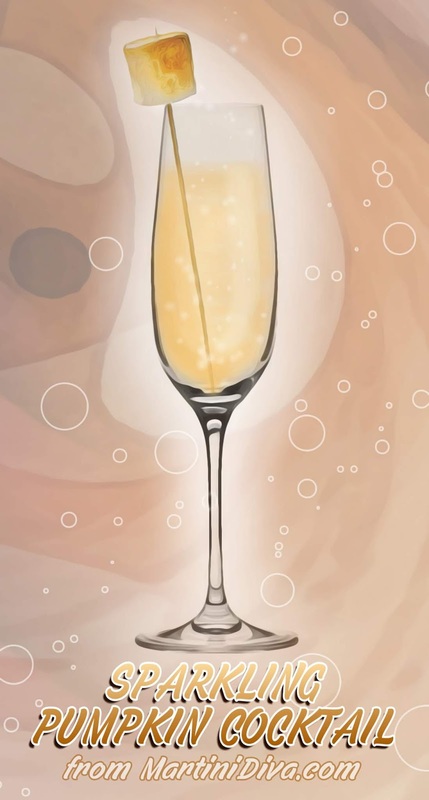 Glass: Champagne Flute DIRECTIONS: Chill your glass in the freezer, then pour in the spiced pumpkin liqueur and top off with the sparking wine of your choice. I prefer a brut Champagne, but the others are nice too and bring their own flavor profile to this cocktail. Stir gently, dust with a little of the pumpkin pie spice and sugar then add a toasted marshmallow.